Tools and Parts Cork seal cutter for piston fillers - three sizes available. Up for sale a range of the cork cutters I developed. Made, fully from steel. as well the perfect size to . . . 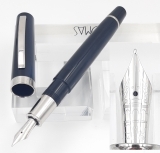 This Meisterstück Soltaire 925 Sterling Silver Pen was made in the late 1980´s. The pen is near mint kept, no signs of use. 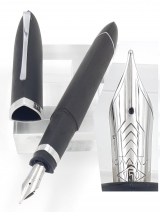 Wonderful pen will be a perfect daily writer with its 14 k Broad tipped nib. 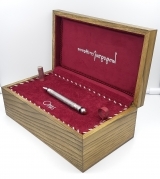 Pen comes in its original gift box and the outer box with the international service certificate. 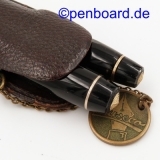 The legendary Kaweco Sport, this one in near mint condition, in its original leather pouch. 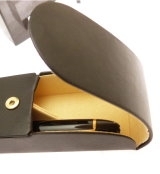 The black set contains pencil and fountain pen. Both fully working. 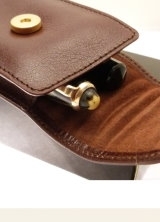 Condition excellent, in the original leather pouch. Condition excellent to near mint, fully working. This is a rare Montblanc 344 made around 1958 Piston filler in classic black in near mint condition and has the clear blue ink window. 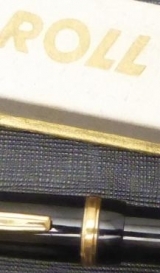 Original 14k gold nib, nib size fine. The pen has no cracks on cap and barrel, no owner inprint. Piston filling system is in perfect working condition, ready to write. 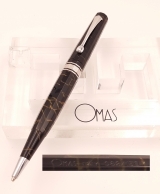 Omas 556 Deskset black celluloid with marble base** Medium tip OMAS nib, flexible. The charme of this set is the near mint condition pistonfiller deskpen. Nib is perfectly kept - and has a wonderful flexibility. Condition near mint pen, pen stand excellent, no brassing, but minimal signs of use. Nib Medium tip OMAS nib, flexible. 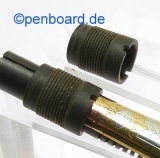 Pelikan Pelikan 100N Cutout demo barrel .. This is a rare demonstrator pen, given to dealers and representatives to show the technique of the pen. 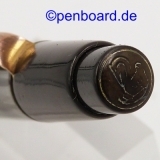 Model Pelikan 100N Cutout demo barrel .. Condition mint, never used :-( piston moves only with difficulties. 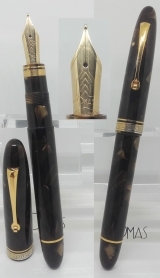 This is a Montblanc Pix repeater pencil made from brown "tiger eye" celluloid.. The pen was made to match the Masterpiece Fountain pen in the 50ies. 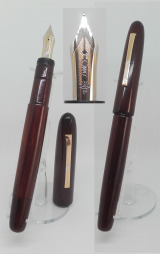 The barrel is new made from original vintage Montblanc celluloid. 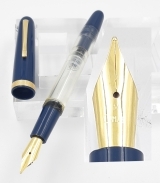 Omas Bologna Dark Mottled Blue Methacrilate Converter/Cartridge 14 Karat "Portici" gold nib, Fine tip, plastic feeder. OMAS Bologna in dark mottled blue methacrilate in near mint conditions. Converter or cartridge system, plastic feeder, 14K gold nib, F tip, HT trims. Minor signs of storage detectable, never inked. OMAS slim pocket case included. 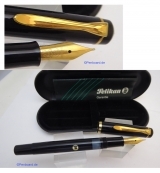 Nib 14 Karat "Portici" gold nib, Fine tip, plastic feeder. 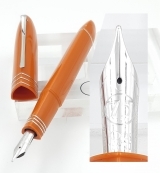 Omas Bologna Orange and Blue Methacrilate Converter/Cartridge 14 Karat "Portici" gold nib, Medium tip, plastic feeder. 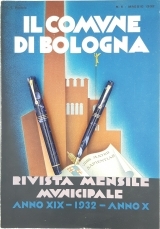 OMAS Bologna in mottled orange and dark blue methacrilate in near mint conditions. Converter or cartridge system, plastic feeder, 14K gold nib, M tip, HT trims. Minor signs of storage detectable, never inked. OMAS slim pocket case included. Nib 14 Karat "Portici" gold nib, Medium tip, plastic feeder. 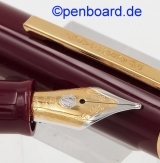 Omas Bologna Red and Blue Methacrilate Converter/Cartridge 14 Karat "Portici" gold nib, Fine tip, plastic feeder. OMAS Bologna in mottled red and dark blue methacrilate in near mint conditions. Converter or cartridge system, plastic feeder, 14K gold nib, F tip, HT trims. Minor signs of storage detectable, never inked. OMAS slim pocket case included. Omas Bologna Red Celluloid Pistonfiller 14 Karat "Portici" gold nib, Extra Fine tip, ebonite feeder. Omas Bologna Red celluloid in near mint conditions. 14K gold nib, EF tip. Minor signs of storage detectable, inked once to be tested. HT trims, OMAS slim pocket case included. 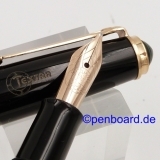 Nib 14 Karat "Portici" gold nib, Extra Fine tip, ebonite feeder. Perfectly kept Omas 360 pen with 18K white gold nib, Fine tip. Ebony wood with HT trims, 925 sterling silver sections (see picture details.) Excellent conditions, only minor signs of use detectable. 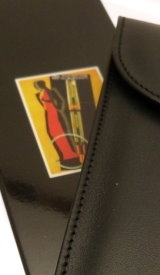 Inked once to be tested, small OMAS pocket case included. Condition Excellent conditions, minor signs of use detectable. Well kept Omas 360 Roller Autumn Celluloid with HT trims. Very good conditions, only minimal signs of use detectable. No box or papers but OMAS sleeve included. Condition Very good conditions, only minimal signs of use detectable. 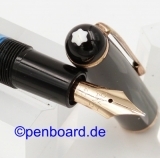 Well kept OMAS 360 pistonfiller Blue Lucens celluloid, 925 solid silver and HT trims (see picture details). Very good conditions, minor signs of use detectable. Rare item: limited edition pen n°999 of 1000. Inked recently to be tested, OMAS original sleeve included. Condition Very good conditions, minor signs of use detectable. 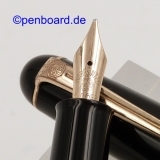 Here is a very good kept L 139 Meisterstück with a short ink view. The pen is fully working, was fully disassembled during restoration, to give it a new cork seal and ensure the proper working of the piston. 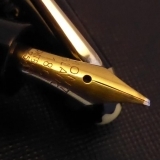 Nib is a 149 14C gold nib . 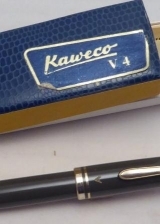 . .
Kaweco V4 Pistonfiller, grey, near mint, boxed ** 14K gold, KM nib, very soft nib with rich inkflow. A wonderfully kept near mint condition pen, by Kaweco from the early 60s. The pen has no sign of use is fully working shows no brassing and no cracks at all. With rare KM nib. ballpointed tip. super soft writer. Condition near mint, serviced and fully working, boxed and papers. Nib 14K gold, KM nib, very soft nib with rich inkflow. 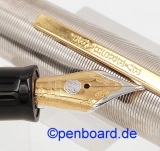 Here is a good kept L 139 Meisterstück with a short ink view. Nib is a 149 14C gold nib with . 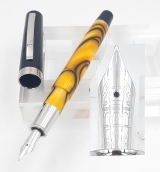 . .
wonderfully kept rare 244 Tiger Eye pen, fully working with a fresh cork seal. One very interesting aspect on top - this pen is imprinted on the cap "FABRICADO EN ESPANA POR..." These imprints are often found on pens, very different from the Hamburg production, mostly made on the 1930ies and 40ies in Barcelona, Spain. Now, . . .
Omas ARCO Brown Celluloid Pistonfiller, Ogiva 14 K vintage gold nib, Fine tip, semi flex. ARCO Brown Celluloid Pistonfiller Ogiva. 14 K vintage gold nib, Fine tip*, semi flex. * The line goes from Fine to Broad depending on the pressure given to the nib. Near mint, never used. Inked once to be tested. OMAS slim pocket case included. Condition Near mint, never used. Inked once to be tested. Nib 14 K vintage gold nib, Fine tip, semi flex. This is the medium size pen of the 24x series. 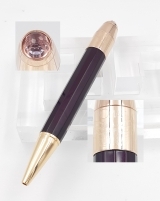 The pen is in wonderful condition, fully restored with a fresh cork seal. No brassing, no crack, and a perfectly kept imprint. This design with the smaller star and the two rings is much harder to find than the Masterpieces of that time. This pen shows . . . Condition near mint, fully working, no brassing, no cracks. Remarks rare 18C nib for French market. Klio is a branded, founded by Mr. Reiser in 1900, in Hennef, Germany. They produced a very interesting dip pen with reservoir. This is a wonderfully made safetyfiller with an unusual hexagonal logo, a black 6 sided logo, inserted into a casein ring. Condition excellent to near mint, fully working, very good imprints on cap and barrel. Klio is a brand, founded by Mr. Reiser in 1900, in Hennef, Germany. They produced a very interesting dip pen with reservoir. This is a wonderfully made safetyfiller with a most beautiful rolled gold cap top. Condition excellent to near mint, fully working, very good imprints on barrel. 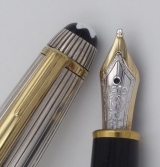 This nib is made of 14k gold and manufactured by Columbus. 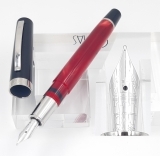 The nib measures 32 mm and has the markings 'Columbus 585% Extra 154'. 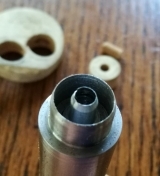 The nib is in perfect condition and has a round shaped breather hole. Condition near mint, used, but in perfect condition,no crack, no dents. This is one of the early versions of this pen. It is fully working, with some minimal signs of use. A wonderful and most beautiful red and black marbled celluloid pen. The pen has is still in its original box - though it may have been inked some times. 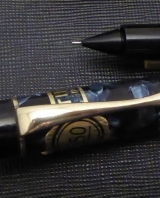 A wonderful and most beautiful blue and black marbled celluloid pen. 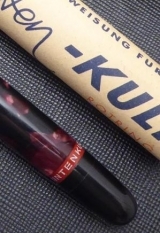 This is a very special Rotring pen, made to compete the ballpoint in the fifties: Instead of the typical Rotring Stilo this pen features a tiny ruby rollerball tip, which very smoothly writes. . The pen does use regular fountain pen ink and has a classic piston mechanism. The pen is in almost perfect condition, still in box . 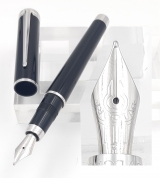 . .
Montblanc celebrated the 75th anniversary of the Meisterstück line in 1999 with a large line of limited and special editions. 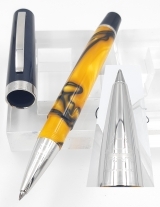 This pen is part of the core line, an edition limited to 1924 pens. The gold trims are rose gold collored and the star is from mother of pearl. Around the cap top, an aditional trim bears . . . This beautiful Octavian Fountain pen is a wonderful replica of the famous Spiderweb designs set over Montblanc pens in the twenties. 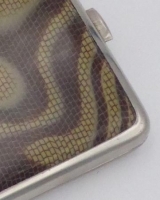 The sterling silver overlay over black prescious resin is in perfect condition. The pen seems never been inked, no visible damage, the box shows some scratches, the outer paper box is hardly used. M nib . . .
from an old stock, found recently, some perfect spare clips for pelikan pens. 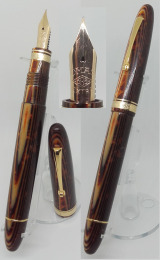 Well kept Omas Bologna Roller pen in Burkina celluloid with HT trims. Near mint, minor signs of storage detectable. No box or papers but OMAS sleeve included. Condition Near mint, minor signs of storage detectable. Omas BULGARI ballpoint pen in Wild celluloid with HT trims. 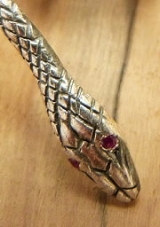 925 sterling silver metal parts (925 marking under the clip). Very good conditions. No box or papers available but OMAS slim pocket case included. Model Omas BULGARI ballpoint pen in Wild celluloid with HT trims. Condition Very good (an almost undetectable scratch on the cap). Remarks 925 sterling silver metal parts. 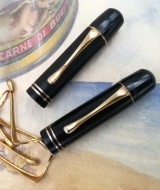 Bulgari roller pen in Wild celluloid (barrel) and black resin (cap) with HT trims. Pen in good conditions, minimal signs of use detectable. No box or papers but original OMAS sleeve included. Condition Good conditions, minimal signs of use detectable. 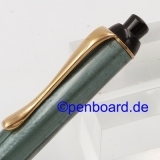 FAO pistonfiller fountain pen in green cotton resin with gold colour trims. Limited edition pen number 0727, 18K gold OMAS nib with M tip. Pen in good conditions, minor signs of use detectable. No box or papers but OMAS original sleeve included. Omas OMAS Ogiva Autumn celluloid with HT trims 18K Paragon size nib with Medium tip, ebonite feeder. Well kept Omas Ogiva 557S in Autumn celluloid with HT trims. Paragon 18K gold nib Medium tip, ebonite feeder. Excellent conditions, inked once in order to be tested. OMAS slim pocket case included. Condition Near mint, inked once in order to test it. 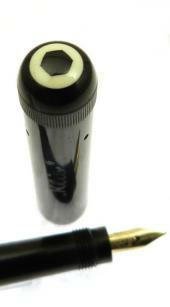 Nib 18K Paragon size nib with Medium tip, ebonite feeder. 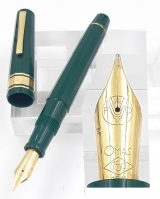 Omas OMAS Ogiva Autumn celluloid with gold trims 18K Paragon size nib with Medium tip, ebonite feeder. Well kept Omas Ogiva 557S in Autumn celluloid with gold colour trims. Paragon 18K gold nib Medium tip, ebonite feeder. Excellent conditions, inked once in order to be tested. OMAS slim pocket case included. Excellently kept 555/F ballpoint mustard blue celluloid facetted with HT trims. Unused pen, OMAS slim pocket case included. 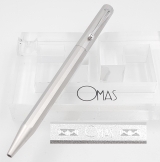 Omas Omas BULGARI roller pen in Rhodium plated 925 solid silver and black resin. 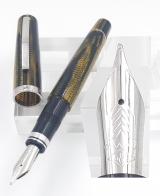 Omas BULGARI roller pen in Rhodium plated 925 solid silver and black resin. Very good conditions, minor signs of storage detectable. No box or papers available but slim OMAS pocket case included. 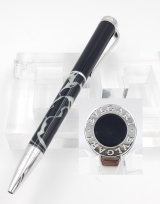 Model Omas BULGARI roller pen in Rhodium plated 925 solid silver and black resin. Condition Very good conditions, minor signs of storage detectable. Omas OMAS Beato de Liébana 925 Sterling Silver and Enamel Fountain Pen. 18K white gold nib, Medium tip, ebonite feeder. Mint OMAS Beato de Liébana 925 Sterling Silver Fountain Pen. 18K white gold nib, Medium tip, ebonite feeder. Minimal signs of storage detectable. No box or papers but OMAS slim pocket case included. Model OMAS Beato de Liébana 925 Sterling Silver and Enamel Fountain Pen. Nib 18K white gold nib, Medium tip, ebonite feeder. Omas Omas 360 Roller pen in Yellow cotton resin with HT trims. Well kept Omas 360 Roller pen in Yellow cotton resin with HT trims. Very good conditions, only minimal signs of use detectable. No box or papers but OMAS slim pocket case included. Model Omas 360 Roller pen in Yellow cotton resin with HT trims. 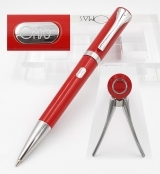 Omas 360 MOMA Roller pen in red cotton resin with HT trims. Well kept Omas 360 MOMA Roller pen in red cotton resin with HT trims. Very good conditions, only minimal signs of use detectable. No box or papers but OMAS slim pocket case included. Model 360 MOMA Roller pen in red cotton resin with HT trims. Condition Very good conditions, minimal signs of use detectable. Well kept Omas 360 Roller pen in Wild celluloid with HT trims. Very good conditions, only minimal signs of use detectable. No box or papers but OMAS slim pocket case included. 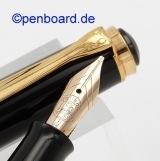 Omas LEGNI PREGIATI PRECIOUS wood, pistonfiller, Ogiva, lignum vitae** 18 K two-colour gold nib, EF tip, ebonite feeder. 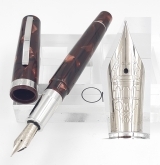 This is one example of the Legni Pregiati edition made in the 1990ies by OMAS. 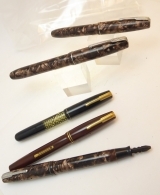 Fascinating set of 15 different piston-filler fountain pens fashioned from exotic woods from various nations. 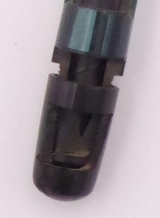 Used pen in good conditions: only a spot is clearly detectable on the shaft and there is a slight diameter difference between the turning knob and the bottom of the . . . Condition Used but in good conditions. 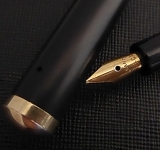 Nib 18 K two-colour gold nib, EF tip, ebonite feeder. Wonderfully kept 400NN green striped pen. Has been inked, but no real signs of use. no scracth, no crack, fully working. Condition excellent to near mint, fully working, inkwindow perfect, fully serviced with a fresh cork seal fit. This pencil has an interesting imprint in the cap top: Pelikan MILANO - it was made in Milano around 1938 Pencil is fully working, and has a beautiful and rare color. A wonderfully kept near mint condition pen, by Kaweco from the mid 1950´s. It is fully working, no cracks at all, shows brassing of cap band and clip. 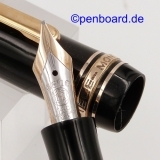 Will be a perfect daily writer with it´s original 14 c OM tipped semi flex gold nib.